Completion of a diploma program or at least two full semesters at an accredited college, OR one year of full-time academic studies at an accredited college. Minimum overall average of 3.0 on a 4-point scale (B/70% or equivalent). All attempted college courses will be included in the calculation of your cumulative grade point average. Courses that are repeated will only count once towards the accumulation of block transfer credit. You must also meet program-specific requirements since some programs have higher averages or have supplementary procedures for admission. *The number of credits you receive and the number of credits required to complete your degree at York University may not match exactly. Depending on the program you are admitted to, you may be required to complete additional courses to meet specific program requirements. An articulation agreement usually provides a simplified, guaranteed transfer process for transfer students. Agreements between various Canadian colleges and York specify the number of transfer credits and the approximate length of time required for a college student to complete a degree at York, as well as specific college courses and letter that will transfer to the university. Dual Credential programs allow you to combine a university degree with an Ontario college diploma or certificate program. For example, York’s communication studies program is a dual credential program with Seneca College. A collaborative program is one in which several schools work together to provide comprehensive education programs, with colleges providing the smaller, more hands-on approach and degree-level courses provided by the larger university. 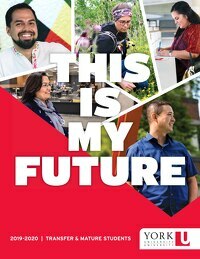 At York, we offer a collaborative nursing program in partnership with Seneca College of Applied Arts & Technology and Georgian College. View the Collaborative Nursing Program page. Find more information about admissions requirements. Once you accept your offer, book an academic advising appointment to begin the enrolment process. If your credit and course assessment has been completed (or you’re waiting for it to be completed), we encourage you to join Transfer Connect – a community just for transfer students and a place where you can ask questions about your transfer to York in a group chat or one-on-one chat. You can also find out more information about specialized resources offered to York transfer students.